In a world where many people are competing for both attention and dollars, the average person assesses the people in their lives and assumes that the most successful and well connected individuals are naturally the people that can help them the most. “Don’t forget me when you’re a big success!” ambitious, young entrepreneurs are often reminded. The best way to gain success however, may not only be the richest most well connected person. Why? A few reasons; there are people known as “gatekeepers’ that filter out all the distracting noise for the well connected. There are young people who ostensibly don’t appear to be “important” connections, which later in life are the most important people to know. The geek, rather than the meek, may actually inherit the Earth. Innovators of fresh ideas, even if they start as the head of their own companies still need to attract investors and executive talent with more experience than they have had the opportunity to acquire themselves. Every great executive has a support staff that deflects incoming information and requests in order to preserve time and resources for their manager. If you want the opportunity to talk on the phone, or meet in person with an important executive, you have to win over the person standing between you and your objective. After all, if you’re successful, these are the people that might become your colleagues or the customers ordering merchandise from you! You are likely to need to have the support and respect of the same people again and again. While the world is a big place, your industry and your city are part of much smaller circles of influence. Your gatekeeper can be an Administrative Assistant, or a junior level Account Manager. But imagine the opportunities that might emerge if as a small business owner you receive the same pricing structure as a huge conglomerate, or you’re the beta tester for an important piece of equipment your competitor doesn’t even know exists? Before you know it, your business has expanded and that Account Manager is now an Account Executive and he or she continues to pave the way for your future success. Always treat gatekeepers with dignity, and let them know that you see who they are as individuals. Pretense will undermine your intent, but truly seeing those people as important will win life long advocates. Remember what matters in their lives and in their work – and be sensitive to when they are busy or overwhelmed. Time your calls at a time good for them, demonstrating that you understand the ebb and flow of their day and the industry in general. If you can, begin your relationship with your stakeholder by doing something for them that makes their lives easier and allows them to shine in front of the person you want to reach. Your new contact may anticipate what you need or hope to accomplish and open the gate wide to help you as a natural response to your generosity. But if they don’t advance your agenda, simply ask, ‘Will you please help me out?’. People do not appreciate a sense of manipulation, especially from an outsider. Even if they tell you they can’t, or worse, won’t help – you’re one step closer to eliminating or circumventing your next obstacle. Why? You’ve identified what it is! People have long memories, and if you’ve managed to step on someone’s toes or caused them embarrassment or harm, they may surprise you with their determination to return the favor. So, if you are working in a group and a person has a great idea, recognize their great idea publicly, and thank them for their contribution. Their role in achieving your overall vision helps you, as well as keeps that person involved and engaged in the completion of your mission. Remember, you may be a piece of their puzzle for success too. Reciprocating the ambitions of your colleagues can help you reach your goals exponentially. Once your idea has begun to mature and is meeting success, demonstrating to financiers that your idea and vision is sound is only one part of the recipe to success. The other part is to demonstrate that you have the leadership capability to make your idea a reality. The people that you’ve met along the way that were exceptional mail room clerks, secretaries, waitresses or shipping agents are likely to become exceptional distribution managers, administrators, customer service or logistics personnel. Ideally, the group of people you assemble will have interests and ideas and goals in common and they will see the wisdom of cooperating with each other – because you’re allowing their dreams to come true just as readily as you do your own. Occasionally, ambitions are dashed in unexpected ways. An individual can confidently see themselves as superior in intellect, ideology and methodology – as though they don’t need anyone else because they have all the smarts they need. Yet when they reach an important milestone such as becoming a columnist or a radio show host, to their own surprise, they fail to gain readers or listeners. Suddenly, all of the smarts in the world won’t help spread their message and meet their goals. Respect, kindness, listening to alternative points of views, and most importantly, refraining from insulting the actions of others months or years before would have seeded an eager audience willing to share their ideas with the world. With the magnitude of social media, managing your potential audience as a stakeholder in your success is more important than ever before. Over time you suddenly realize you’ve carved out a special niche, and you’ve become the business person, artist, or performer you always hoped you would be. You start hearing from your subordinates and newcomers that your knowledge base is a treasure trove and should be shared with the next generation. While you look back over 35 or 40 years of hard labor, dreams and aspirations, each person you’ve given a smile or a hand up, celebrates your success with you. 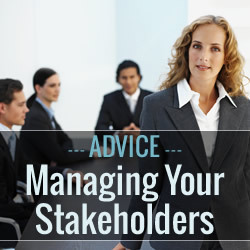 The art of managing your stakeholders is as important as any intellectual property you conceive, because after all, if your ideas remain closeted, who will ever benefit from them, least of all you! Liora Farkovitz is an independent Content Strategist who writes, narrates, publishes and promotes on behalf of professionals and subject matter experts. With more than 20 years experience as an entrepreneur she often writes on the topics of small business and product development strategy. Ms. Farkovitz lives and works in Brooklyn, New York with her husband, Artist and Master Goldsmith, Louis Farkovitz.